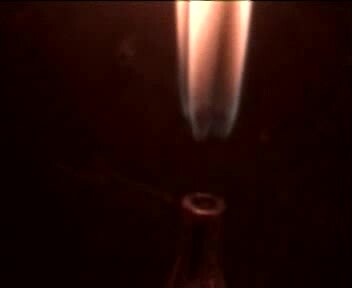 Experimental studies of combustion of gaseous fuel (propane) in macrojet at the nozzle exit show that the laminar jet combustion process with a flame attached to the nozzle exit takes place at low jet outflow velocity. As the outflow velocity increases, combustion of a turbulent jet with a flame lifted from the nozzle exit is observed. It is possible to clearly see the deformation of the first ring vortex at the end of the turbulent jet flame separated from the nozzle exit, which is caused by the presence of streaky structures.